This week is the perfect temperature. Chilly and brisk without being completely hunker-down cold. It’s the ideal weather for taking a stroll with a hot drink in hand or sitting in the window of a shop sipping on out of a mug. 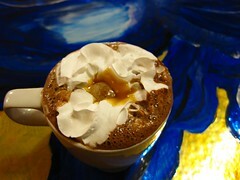 Which got me to thinking – where can you find some unique hot chocolate in DC? None of that Starbucks generic mix, but some original, interesting mugs of the good stuff. Here are a few of my top suggestions. 1) ACKC - Jenn wrote up ACKC for a We Love Drinks when they opened in 2008, and it’s been a crowd-pleaser ever since. Located on 14th street, ACKC has all sorts of chocolaty drinks named after old movie stars. Jenn loves the Audrey, I’m a Judy Garland kind of girl myself. ACKC also has a location in Alexandria, if you’re out that way. 2) Co Co Sala – For all things chocolate, I head to Co Co Sala. I adore everything about that place from the sleek, brown and red interior to the savory bites and the chocolate bacon. But my love goes beyond the food – Co Co Sala does hot chocolate flights, with flavors like Peanut Butter, White Chocolate and Salted Caramel. A flight of three is only $8 ($6 each) and located in Penn Quarter, Co Co Sala is the perfect non-traditional happy hour treat or Sunday afternoon get-together. 3) Love Cafe – Cakelove’s flagship restaurant, Love Cafe, not only has cakes and cupcakes, they also have a killer cup of hot chocolate. Located on U street, you can grab a cup to-go and explore the area’s stores. Some of my favorites are RCKNDY and the killer vintage store Treasury (where I got a fabulous purple dress recently). Adorable weekend browsing, with the ideal drink accompaniment. Where is your favorite hot chocolate in DC? Tell me in the comments. Schakolad at 19th and L is AMAZING. They make it with melted chocolate, milk and if you want it flavored they put truffles in! DELICIOUS. Pitango Gelato now serves Italian-style hot chocolate. Simple, plain, insanely good. They were serving up some delicious and creamy organic hot coco at the Dupont Circle’s Farmer’s Market this past weekend. It was really, really good. Call me crazy but I love the hot chocolate at Dunkin Donuts. Maybe it’s because it reminds me of my childhood. I love ACKC as a general rule. However, a new shop in Georgetown offers Parsian style hot chocolate. It’s just a couple of blocks from my office so I really need to get down there and try it out. I’m a fan of the hot chocolate (and coffee, and everything else) at Le Pain Quotidien. The Curious Grape in Shirlington carries tins of Aztec dark hot chocolate from Marie Belle. You have to make it yourself, but when done right, it’s creamy and rich and thick, almost like pudding. I can’t believe no one has mentioned Baked and Wired yet!